Adult learners generally abandon their academic journey for competing work obligations and varied life pressures. 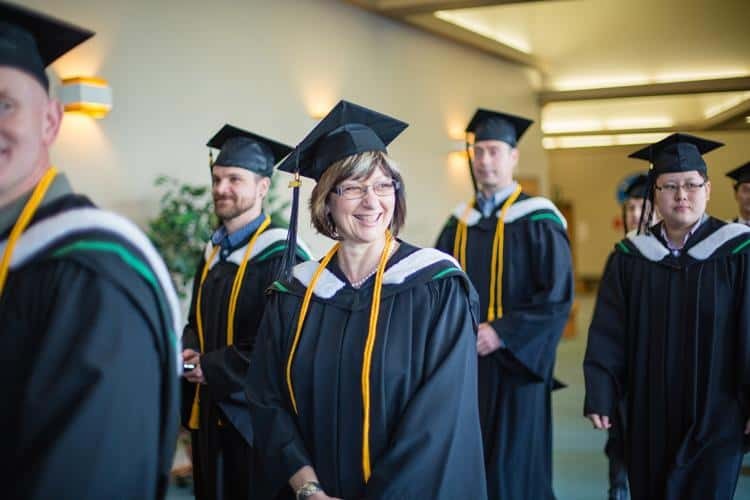 Degree completion for busy adults is at the heart of the Adult Degree Completion (ADC) program at Trinity Western University (TWU). With an accessible, customized and flexible learning model, the program enables adults to remain in their jobs and finish their degree simultaneously, and is designed to help students complete their degree without sacrificing personal, family or professional responsibilities. ADC is an accelerated program offering a BA in Leadership or a BA in Psychology that can be completed in as little as 18 months, depending on your academic history. To meet the admissions criteria, adults must be at least 23 years old with two to three years of workplace experience. Start dates are ongoing throughout the year and courses are scheduled over six weeks, one evening class per week in different sites: Langley, Richmond, Bellingham, WA, (psychology only) or online. TWU places a strong emphasis on relevant courses with practical, direct application to workplace and everyday life. By completing the BA in Leadership program, students gain a competitive advantage in their professional setting and learn to lead themselves, teams and, ultimately, an organization. "The program helps give students the confidence and skills to be able to navigate opportunities in the marketplace," says Mark Halvorson, associate dean of the BA in Leadership program. "We recognize students require a return on their education and we're trying to create a program that helps them develop the skills necessary to find the opportunities, create a vision where they want to go and attain the results they want to achieve." As a student in the program, you will join a cohort of typically 18 to 24 individuals with a wide range of experience in diverse industries. You'll collaborate with and learn from your peers as a cohesive team. The small cohort format fosters a high level of engagement and interaction with accredited instructors (mostly full-time professionals), and helps to cultivate relationships and support networks that add value throughout your education and well into your career—an experience relatable to ADC graduate Zaighum Punzalan. "I gained exposure with people in education, finance and so many different fields who shared their perspective with me," he explains. "I've created a lifelong professional network with cohorts from TWU's BA Leadership program." Punzalan continued his employment at McDonalds during his 2018 studies and was able to leverage his education during his enrolment. "Management noticed a significant transformation in my leadership style—in the way I communicated and the way I performed in general," says Punzalan. "I applied what I learned in class directly to my work, which earned me two promotions in just a few months, plus my salary increased considerably." Punzalan is off to Australia in June to pursue a career opportunity, an aspiration largely influenced by the course "Leading in the World," which equips students with a global mindset. "I wouldn't have had the confidence to take the risk, quit my job and move on to the next adventure had it not been for completing my degree at TWU."